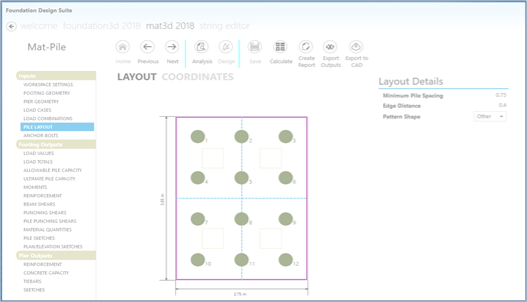 mat3D-2018-basic | Dimensional Solutions, Inc.
Our simple yet powerful structural mat foundation design solution, the “Basic” version incorporates many features and functions to complete soil and pile supported footing and pedestal design in minutes. Supports both of these units for input and output and converts them on the fly. Extensive set of settings allow completion of various kinds of projects. Customize your concrete, reinforcing steel, soil, pile, rebar and other parameters to meet your project or client needs. 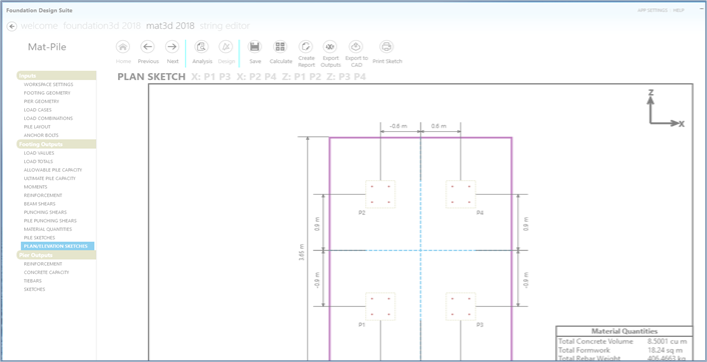 Easy-to-use graphical interface provides a user-friendly way to input footing/pedestal/pile geometries with support of various shapes of these components. Allows input of load cases and combinations in a user-friendly manner. Completes both soil and pile supported foundation designs in an integrated environment, allowing you to consider many “what-if” scenarios for an optimal solution. Supports both analysis and design modes to complete grass-roots or revamp projects. Completes design of various components of a foundation such as pedestals and footing. Provides rebar layouts in pedestals and footing with customization options. Generates material quantities so you can provide accurate cost estimates to your customers at every phase of the project. Generates detailed design sketches with foundation plan, elevations and sections. Generates detailed reports in Microsoft Excel for your internal or client needs. Supports import/export of data from/to Excel.